Once settled in Norway I got a day job in the travel industry, while continuing to play semi-pro at night and in the weekends. For many years I lead my own band, called 004 (Zero, Zero, Four), playing the popular music of the day. Beside the commercial gigs I have played jazz in big bands, octets, septets and smaller combos. I played with Norwegian jazz pianist Eivin Sannes , when he was still living in Bergen, Norway. Once after he moved to Oslo, we played together again there every now and then. While he is best know as a pianist, he played the Hammond organ while I worked with him in a trio, together with the late drummer Svein-Erik Gaardvik . So Eivind had to play the bass line with his foot! I also worked with vibraphonist Arvid Genius, in Bergen, Norway. (I think that the vibraphone sounds very nice together with the guitar). Arvid has now moved back to his native Germany. Around that time I was lucky enough to take over the apartment of guitarist Halvard Kausland ( † ), who was moving east. Before he moved we woodshedded quite a lot together. In 2002 he made his first CD under his own name on Hot Club Records, called "Good Bait". Until a few years ago I played with the Norwegian tenor sax player Kjell Tombra ( † ) as a duo. We used Jamey Abersold 's CDs and Band-in-a-Box as comp, played through a Fender Passport PA.
Then I started to work either alone, as a "one-man-band" (called: G7 *). 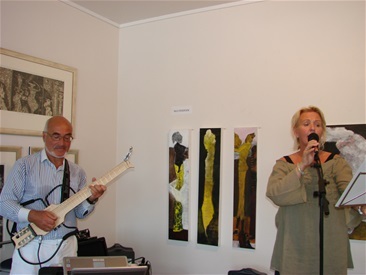 I also worked for a period with singer Anne Ma Bakke as a duo (called: J & B, which stands for Jazz & Bossa Nova) . In both cases using Band-in-a-Box as my/our "band". It really does swing and makes us sound like "a million". *) G7 is a name with an intended pun, referring to the chord G7 , a G uitar with 7 strings and the (former) name for a group of the seven richest countries in the word.